Assoc. 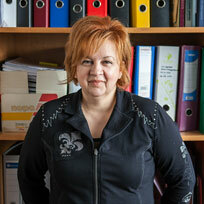 Prof. Reneta Dimitrova, PhD, started her academic career in the Academy of Economics ‘D.A. Tsenov’ in Svishtov. She has years of experience in the field of banking. She has taught at the University of National and World Economics, the Economic Department of Sofia University, etc. Since year 2000 she has been a full time lecturer at NBU. She has held different positions at the university: Director of the Finance Bachelor programme, Director of the Business Administration Module and a Programme Director in the Economics and Business Administration Department. Currently she is Chair of the Department of Economics. Assoc. Prof. Dimitrova’s main academic interests are in the field of finance, more specifically in the banking sphere. At NBU she is a lecturer in: Introduction to Finances, Banks and Financial Intermediaries, Banks and Banking Services, Analysis of Banking Activities, Bank Management, etc.